MONZA - In one of the most exciting races of the season, reigning champion Sebastian Vettel dominated and cruised to an easy victory, his 3rd win at the Italian GP and extending his lead to 53 points in the Driver's Championship. RedBull's Sebastian Vettel claimed his 32nd win in his F1 career, tied with Fernando Alonso. ﻿﻿Sebastian Vettel took a giant step towards his fourth World Drivers Championship with another dominant display here at the Autodromo de Monza. His win contained just one mistake, a huge lock up going into the chicane at the very start of the race giving him an uncomfortable start. ﻿﻿﻿﻿Just before the start there was indecision by the teams on which tyre to start with. Light rain showers meant that teams were looking to go with intermediate wet tyres. However the track dried as cars went out to the track and teams opted for dry tyres to start with. The first 10 cars started on the softer medium tyre with Lewis Hamilton and Kimi Raikkonen starting on the prime (hard) tyre to give them the benefit of a faster finish with the option (medium) tyre. So to the start itself. A clean getaway for most except Jenson Button who was slow away and immediately dropped positions. Sebastian Vettel held his position but locked up his front right wheel heavily into the first chicane. 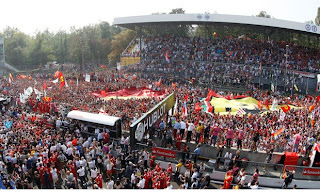 However he exited still in 1st place and had a clear run into Curva Grande. The rest of the pack got through with the exception of Sergio Perez who had to take the escape road and give positions back as he rejoined the race. Paul DiResta crashes out at the second chicane. The early laps saw Lewis overtake Kimi who had to pit for damage to his wing. Fernando Alonso pulled off one of the great overtakes of the race while passing Mark Webber side by side through the second chicane! Great trust and respect shown to each other during the move clear to see, great stuff! Fernando went on to easily overtake his team mate Massa going into the first chicane on lap 8, surely team orders there as Felipe offered little resistance. Meanwhile Sebastian receives a radio call acknowledging the discomfort of his flat spotted front right tyre, then promptly puts in a fastest lap of the race at a stunning 1:29.008. On lap 12 disaster for Lewis as his team inform him he has a slow puncture and needs to box immediately! However a radio problem means Lewis does not hear the call and stays out. Only his mechanic franticly waving a pit board telling him to pit eventually brings him in and he changes to medium tyres. Lewis and Kimi start recording fastest lap times as they try and catch the leaders. Eventually on lap 23 Seb was very relieved to come in and change his lumpy tyres to a fresh set of primes. On lap 31 Lewis pulls off a stunning overtake on the inside around Curva Grande on Hulkenburg and gets himself up to 5th although would have to stop again. Lewis has to pit again and comes out just behind Kimi in 14th. Again Raikkonen and Hamilton trade fastest laps and make some good overtakes, clearly the entertainment of the race with fighting drives! At the front, Seb continues despite a gearbox problem and holds off a challenge from Fernando Alonso to take the chequered flag yet again! 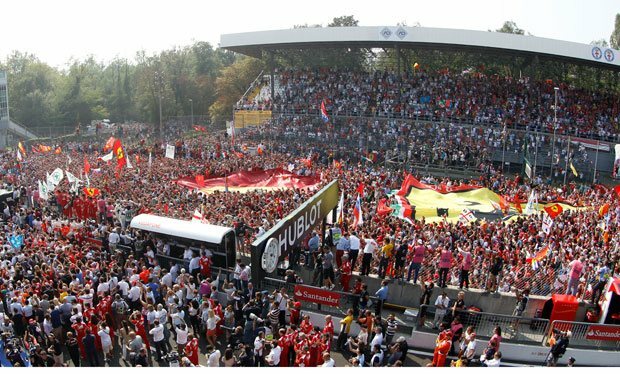 The podium was engulfed by the amazing Tifosi who made their feelings very clear by booing Seb as he spoke to John Surtees. There was only love for their man Fernando Alonso who put in a great drive for second. Mark Webber's last ever F1 race in Europe was marked by a 3rd place and he will be sorely missed next season. My drivers of the day were Nico Hulkenburg (p5) and Lewis Hamilton (p9), great fighting drives under difficult circumstances. WINNING TIME: Vettel - 1 hour, 18 mins, 352 seconds. ﻿﻿ The championship now moves on to the flyaways and Singapore now beckons in two weeks time. Seb's rivals need to win or this championship is over! Coverage and Review of the Italian GP Race in 2013.